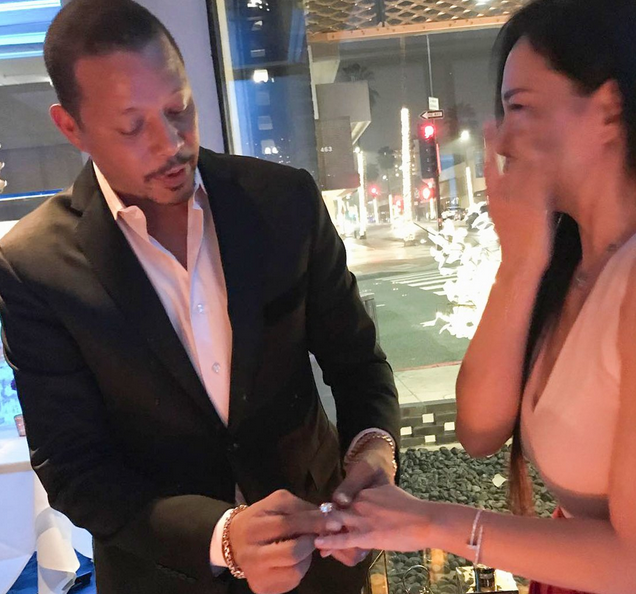 Terrence Howard wants that old thing back and isn't afraid to make it official official once again. Three years after divorcing his ex-wife Mira Pak, the 49-year-old actor popped the question yet again on Christmas, hoping to get it right this time. "Thank you @benballer @ifandco The Most Gifted Jeweler in The World!! !," Terrence captioned. "Valentines coming soon, let’s show them how to truly Love your Woman! @jeanneyangstyle get ready this a family affair! @crustaceanbh thank you for making the night extra special. #bloodisthickerthanwaterbutloveisthegluethatbindsus"
The Oscar nominee also shared a video of the toast he made to his new wife again, vowing to spend the rest of his life with her...foreal this time. Mira replied, "I love you too, baby." You'll recall, news about Terrence and Mira getting a divorce in 2015 was leaked during a court battle between Terrence and his ex-wife Michelle Ghent. He accused her of extorting him for money and blackmailing him. According to reports, the Pak/Howard divorce judgment was granted in Chicago, and was entered the day before his deposition in the Michelle Ghent proceeding. Merry Christmas Thank you @johntsiavis @merrellhollis @jeanneyangstyle for making this happen! Terrence and Mira tied the knot in October 2013. Mira gave birth to their first child together, their son, Qirin, in May 2015. Then, they welcomed another son, Hero, in August 2016. By the way, Terrence (who is a grandfather) is also the father to daughters Heaven and Aubrey and son Hunter, whom he shares with his ex-wife Lori. Congrats (again) to the couple. NEXT: Lira Galore Announces Pregnancy After (Ex?) Boyfriend Pierre - Head Of Quality Control Label - Outs Her AND Allegedly Impregnates Someone Else.